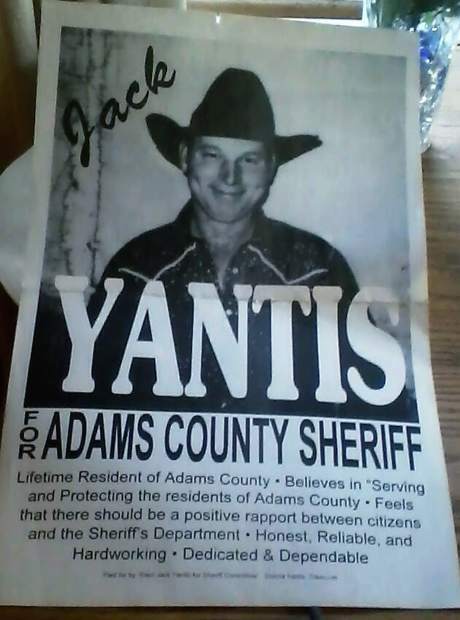 Jack Yantis, who was killed by Adams County deputies while trying to put down his injured bull, once ran for sheriff of Adams County. The current sheriff, Ryan Zollman, has come under fire for his handling of the shooting and other incidents in his jurisdiction. Courtesy photo. Idaho Code 18-4001 criminalizes murder, which is defined as the unlawful killing of a human being with “malice aforethought.” Murder may be in the first degree if committed to execute vengeance or if willful, deliberate, and premeditated. Idaho code 18-4003. Second degree murder is any murder that is not first degree murder. Idaho Code 18-4006 criminalizes manslaughter, which his defined as an unlawful killing without malice. Voluntary manslaughter occurs when the unlawful killing is “upon a sudden quarrel or heat of passion.” Involuntary manslaughter, as potentially applicable to this case, occurs when the unlawful killing is: (i) without due caution and circumspection during the commission of a lawful act which might produce death, or (ii) in the operation of any firearm or deadly weapon in a reckless, carless or negligent manner. That is one of the few undisputed facts in a saga that started nine months ago and only recently reached a tenuous conclusion. The conclusion: Following an investigation by the Idaho State Police, Idaho’s Office of the Attorney General (OAG) declined to press charges against the two Adams County deputies who shot Jack Yantis 12 times as he attempted to shoot his own injured bull. Sunday, Nov. 1, 2015, at about 6 p.m. a Subaru carrying two passengers down Highway 95 in Idaho hit a 5-year-old Gelbvieh bull owned by Jack Yantis. The two passengers were airlifted to the hospital. At 7:22 p.m., Deputy Cody Roland radioed dispatch, asking them to contact the owner of the bull that had been hit– standard procedure, allowing the owner to make the call about whether the animal could be doctored or salvaged, or needed to be put down. He reported that the bull was getting more agitated and he feared for the safety of the people responding to the accident. Roland said the bull charged and Deputy Brian Wood shot it six times with his personal AR-15 .223 caliber, wounding the bull, but not killing it. 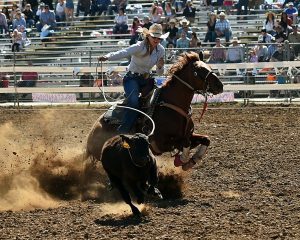 During an interview, Roland told investigators that he had grown up in a ranching community and owned cattle, and knew the rifle Wood carried wouldn’t be very effective at euthanizing the bull. Roland said he’d responded to lots of livestock incidents and told Wood they needed to treat the ranchers “with kid gloves” because ranchers care about their animals. The bull stopped coming toward the deputy and lay down along the road. Immediately after that, Jack and Donna Yantis pulled up on a four-wheeler. Jack got off the four-wheeler and Donna handed him a rifle. During the interview Roland said, “It’s one of the few incidents where there’s gonna be somebody you don’t know in your scene with a loaded gun and you let them do it. You’re just kind of there if they need any help. You’re just there to help. The general consensus of the two deputies and Donna Yantis is that Jack initially intended to shoot south, toward where Donna was sitting on the four-wheeler and where emergency personnel were still working at the accident scene. Donna was going to move, but Jack moved a little and Donna and Jack’s nephew, Rowdy Paradis, who had arrived at the scene with a skid steer, said where he was aiming wouldn’t be a threat to anyone. The deputies were still concerned about the line of fire. Donna Yantis and Paradis said it appeared that the deputies didn’t say anything, but grabbed Jack and jerked him backward, so he stumbled, but maintained control of his rifle. Paradis said he did not hear the gun go off and he didn’t think Jack fired the gun, but couldn’t be certain. He told investigators that if he had been in that situation and been pulled away with his finger on the trigger, he may have accidentally fired the gun. Testing of the firearms used in the incident showed that Yantis’s bolt-action Ruger .204 had a pull of between 2.5 and 2.75 pounds—about half the trigger pressure required of either of the two deputies’ firearms. Paradis said the deputy pushed Jack away, grabbed his own gun and began firing. The deputies shot until Jack was on the ground, according to Paradis. Donna Yantis’s and Paradis’s accounts differ in regard to which deputy grabbed Jack and whether they grabbed his vest or his arm. Roland claims that Jack swung his rifle toward Roland, across Wood’s belly, when Wood stepped forward with his hand outstretched. Roland said Jack shoved Wood when he reached for the rifle, and wasn’t sure if Wood had actually touched Jack or not. When Roland realized Wood didn’t have control of the rifle, and that it was pointed toward Roland, he reached for his handgun. Wood said he thought the rifle was pointed at Roland’s chest, and Jack made a motion like he was going to fire. There was a gunshot and neither deputy knows whether Roland or Jack fired first. Roland thought he’d been hit in the side, so he fired back, and Wood fired his AR .223 in response to the gunshots and Roland saying he’d been hit. There were no marks on Roland and Jack’s was the only blood on the bullet that likely was fired from Jack’s gun. At 7:27 p.m. Roland alerted dispatch that shots had been fired, the owner had been shot. The five minutes in between the phone call to the Yantis residence and the shots fired are the ones it has taken 5,300 pages of documents, 590 photographs and 30 hours of audio and video recordings to unravel. The deputies put handcuffs on Paradis, fearing he was armed and knowing he was angry and yelling at the officers. Paradis said the officer “slammed” Donna Yantis down and Donna said they handcuffed her, but accounts of those events vary. Yantis’s rifle scope and the stock of the rifle were damaged by gunshot. A 20-caliber bullet that most likely came from Jack’s .204 was found at the scene, but the FBI expert who tested the bullet would not say conclusively that it came from Jack’s rifle. A spent shell casing was in the chamber of Jack’s rifle. The EMTs responding to the shooting from just a few hundred feet away, where they had been caring for the car accident victims, said they knew when they arrived on the scene that lifesaving attempts would not be successful, based on the amount of blood and Jack’s fixed gaze. An autopsy showed 12 bullet wounds, four from Roland’s Glock Model 30 .45 and eight from Wood’s semi-automatic .223. Yantis’s wife, Donna, witnessed the shooting and was removed from the scene in an ambulance, being treated for a heart attack. She spent the next two weeks in the hospital. Wood was wearing a body camera, but it was not recording. Roland had left his body camera in the car, since protocol was to not use it in responding to accidents. The two officers were immediately put on paid administrative leave, according to department protocol. Adams County Sheriff Zollman recently confirmed that Roland resigned at the end of November, less than a month after the shooting. In a television interview last week, Wood and Roland said they are still exploring their options and Wood said he and his wife are building a house and don’t plan to leave the area. Both said they aren’t sure they want to return to work as law enforcement in Adams County. Zollman said the officers and the sheriff’s department received numerous death threats throughout the investigation, many from animal rights activists. No officials or family members could comment on the case because of a pending lawsuit. The Yantis family has filed a tort claim — a precursor to a lawsuit — citing wrongful death, assault, false imprisonment and emotional distress against the Adams County Sheriff’s Office and the two deputies involved, according to the Idaho Statesman. The family is asking for $500,000, the maximum allowed under Idaho law.